These were great favor gifts for the guys at the baby shower. Actually the girls and kids liked the bubble gum too. Great for celebratory occasion. Cute as heck! However, the gum was stale & old. product success at the baby shower! This item will be used at a baby shower. The guests will love it and the father will give them out. Great way to continue a tradition for non-smokers!! Worked well as baby shower favor. Q:I need atleast 50 for a baby shower. If I purchase 1box with 36 in it, Can I buy 14 individual. A:These are not sold individually, they are only sold in cases of 36 units. If you need 50 you would need to purchase two cases. Q:If I buy them now, will they still be fresh(good) in June? Q:Is this product made in the USA? A:These bubblegum cigars are made in Canada. Why are our "It's a Girl" bubblegum cigar favors so perfect for a co-ed baby shower? They're smoke-free, so the mommy-to-be can be around for the celebration, too! 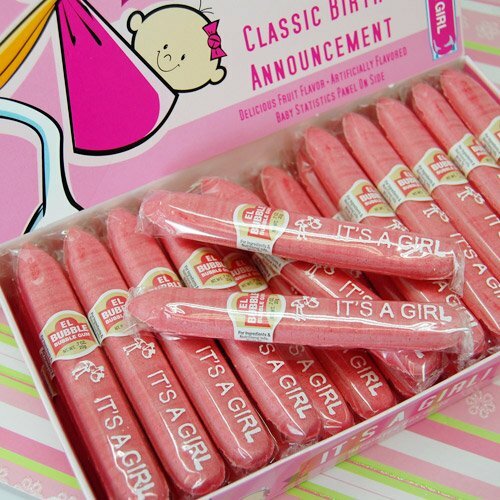 Pink bubblegum cigars feature fun baby shower-themed "it's a girl" wrappers. Each cigar-style box includes 36 individually wrapped fruit flavored cigars. Cigar box measures 7.75"L x 4.5"W x 1.5"H. Cigars measure 4.25"L, 0.68" diameter.